At the start of the war those men enlisted as orderlies in the Royal Army Medical Corps (RAMC) had often been rejected by the army as physically unfit, prohibited from being a soldier by age, height, and even flat feet. As the war progressed the army became less fussy as the need for more men to fight was so great. 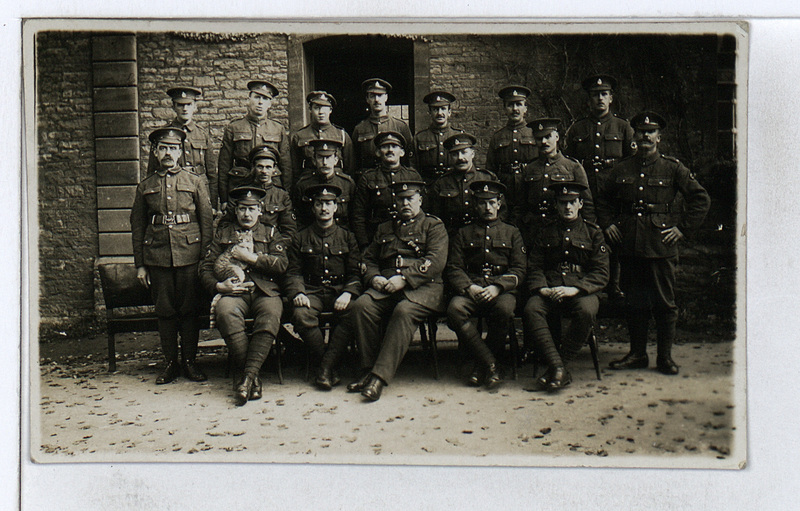 At the Beaufort War Hospital orderlies were under the command of Sgt Major Kench (in the centre of the photograph). Their day started at 6am and their duties included serving meals, scrubbing floors, emptying bed pans, wheeling patients to XRay and operating theatres, fetching and carrying from the wards to the kitchens to the laundry. The artist Stanley Spencer, and his brother Gilbert were orderlies at Beaufort. Spencer’s wonderful paintings of the every day work of an orderly at Beaufort War Hospital are to be seen at The Sandham Memorial Chapel, Burghclere. Many former asylum attendants were recruited into the RAMC as orderlies when the Beaufort War Hospital opened in 1915. We have found the service records of a number of men who lived locally in the Fishponds area of Bristol. The building was called locally ‘Fishponds Hospital’. 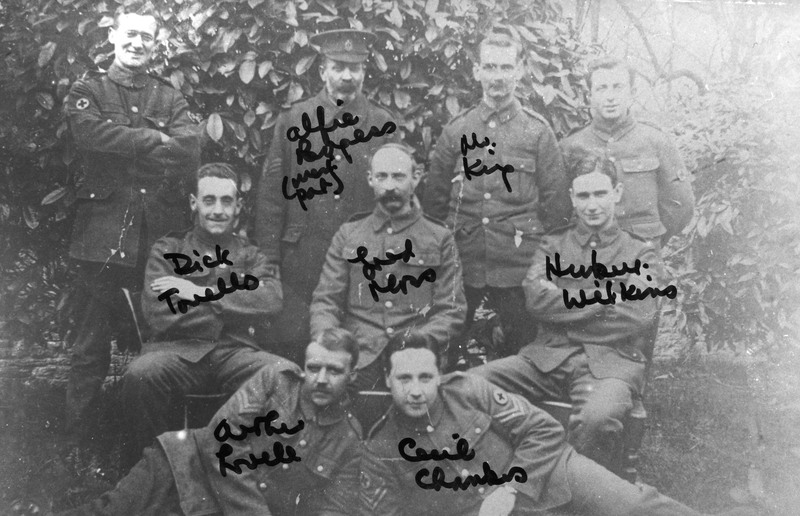 Some of the orderlies lived in the same street, and enlisted on the same day;19th May 1915. The first convoy of wounded arrived at the hospital on May 24th 2015. It is thanks to William Witchell that we have so much material about the hospital; archive photographs and letters. He enlisted in the RAMC on the 25th May 1915, his occupation listed as grocer. William was put in charge of the stores, and was working at Beaufort at the same time as the artist Stanley Spencer. It was William’s stories of Beaufort that inspired his son in law, Kenneth Pople, to write his acclaimed biography of Stanley Spencer. William Witchell kept postcards, letters, and informal photographs of his friends and colleagues which have helped enormously in our research. 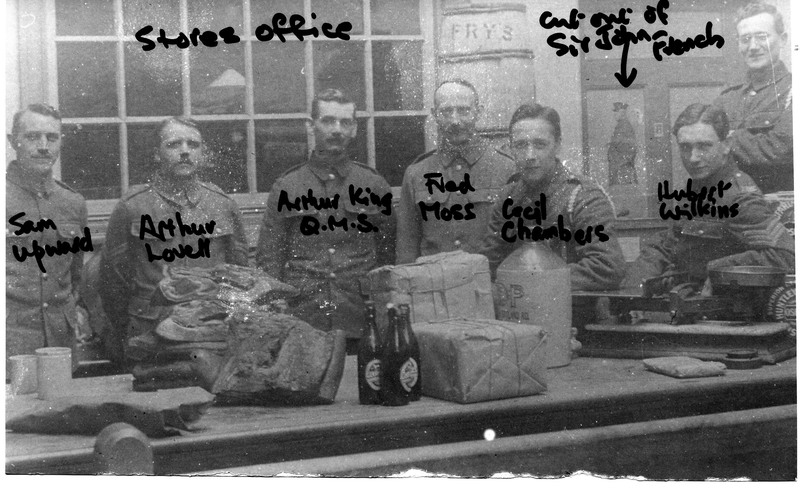 In the above photograph of ‘The Stores Office’ William is standing top right, wearing glasses.